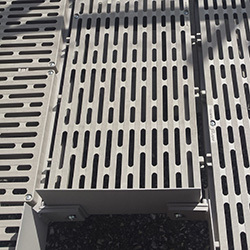 With high strength aluminum and superior finishing, our ramps are of the highest quality in the industry. With our exclusive use of ThruFlow™ decking on the surface, our ramps are extremely quiet and safe in use with virtually no maintenance. 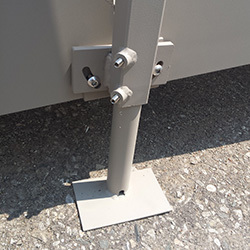 Ready to ship within days, with common tools and easy connect features so our ramps can be installed by almost anyone in Canada and the USA. With help from our 'Ramp Builder' software you can design your own specific ramp layout right on our website for faster & more accurate quotes. We ship across Canada & the USA! QRamp™ has market leading, exclusive safety features. 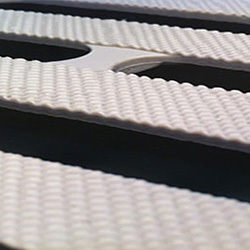 QRamp™ is the best looking ramp to put on your home. With the fewest pieces QRamp™ is designed to be available near you, right now! QRamp™ is designed to look good and perform flawlessly. Our ramp can be configured to fit almost anywhere. It is the perfect solution for residential environments and small to midsize commercial applications. Most often when someone needs a ramp, the need is very time sensitive and it has to happen fast. QRamp will guarantee a quote within 24 hours and we can have a ramp delivered anywhere within Canada or United States inside of 1 week. That is our commitment to you. The QRamp modular access system was born out of a need for an aesthetically pleasing, removable, easy to assemble access ramp, for those who either can’t or don’t want to go through the arduous and lengthy task of installing a permanent ramp at their home. It all started when our founders mother, 78 year old Anita, was due to come out of the hospital in two weeks, after having surgery. Knowing that she would be in a wheelchair and in need of a ramp to get into her home, he desperately searched for anything that could accommodate her needs. After many phone calls and web searches, he soon discovered the road blocks that stood in the way. Carpenters could build the ramp in weeks or months but had high labour and permit costs associated with the installation. 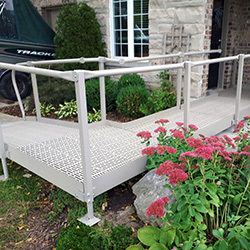 Modular access ramp companies promised ease of installation but delivery times and shipping costs were high, not to mention the add on costs and poor customer service. Finally, a temporary means was found but Anita felt she had lost her independence. 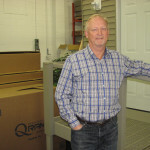 This was unsettling to Otto, a long time tool and die expert and so he set out to start a company that could deliver a modular access system that was affordable, good looking, quick to ship and easy to install. And so today, QRamp is a product born out of a need but facilitated by experience in the automotive engineering and marine construction technologies. This company is located in Wallaceburg, the extreme south-west province of Ontario in the municipality of Chatham-Kent, Canada. We are about 60 Km (40minutes) northeast of Detroit Michigan, U.S.A, just across beautiful Lake St. Clair. In this picturesque small town is a little known center of tooling and design expertise, long utilized by the Big Three automotive companies in Detroit. A small but dedicated and informed company, we can surely help you get the access you need today. With many thanks to the person who has enriched the lives of many. The guiding force and entrepreneurial spirit behind the business. Otto’s experience includes tool and die, plastic injection molding and a genuine affinity to helping those in need. Watch this video to learn how you can easily install your own QRamp! I was injured in a head-on motorcycle accident several months ago and I have been recently released from hospital. I am in a wheelchair likely for the next year. I got two days notice from hospital before being discharged and I wondered how I would be able to get into my house. I had a QRamp installed in front of my house; my boyfriend commented how quickly it was installed saying they were only here about an hour and a half. The ramp not only blends in very nicely with our house but provides the access to my home that I need. We have gotten compliments from friends, neighbours and relatives about how neat and attractive the ramp is. It’s also really non-slip and my PSW has said that even when there is dew, it is not slippery at all. I’m moving at the end of the month and the ramp will be easy to take down and move with us. I needed a ramp soon because winter was fast approaching and with where I live in Ontario the snow was starting to fly. I tried to purchase one through a pretty well advertised company. It took over 6 weeks to get here and when it did, it was damaged. I returned it and called QRamp. I purchased it, had it delivered and installed it myself all within a week. Very pleased with my experience with QRamp.